Last week, I shared a wizard that allows you to select an external Customsettings.ini file. 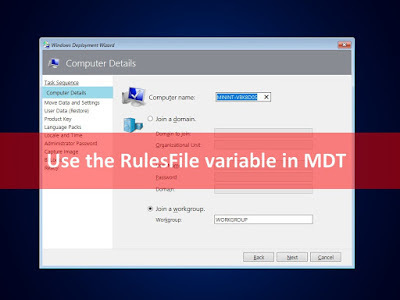 In this quick post I will show you the MDT variable, RulesFile, that is used in this wizard. As I often say, you can do almost whatever you want with MDT by looking at the files from the Scripts folder. For instance, in ZTIGather.wsf you can find how is used the Customsettings.ini. See below the used part for the ini, line 2115. As you can see there is an awesome variable, awesome for me :-), called RulesFile. It will determine the path of the ini file, by default Customsettings.ini, to apply during your deployment. In my previous post I used this variable as below. All external ini profiles are listed in a ListBox and once a profile is selected the RulesFile variable will use the path of this profile. Then let's browse to the VARIABLES.dat file and open it. We can see that the value for the Rulesfile variable is Workgroup_French.ini. After looking to the dat file we can see that the RulesFile variable is now Workgroup_Spanish.